Framed in some places as the sort of “tall tale” typically spun fireside to frighten drunk friends, Emily Carroll’s entry in Youth In Decline’s Frontier anthology series is chilling, and crafted masterfully. 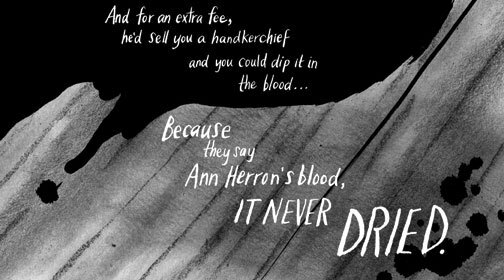 The 32-page comic (available here), titled “Ann by the Bed,” tells the story of a ghastly 1930s-era murder of a woman named Ann Herron, committed in Southern Ontario, Canada — it’s well-written fiction styled as the kind of legend that inspires at least one specific teen’s party game mentioned here, but the award-winning Carroll (see 2013’s “Out of Skin” for more grisly, beautifully produced horror, as well as her Through the Woods), peppers the script with newspaper report-styled quotes, dates, and grim specifics. Herron’s murderer wielded a hatchet on an autumn morning in 1934, writes Carroll. “There is evidence Ann fought,” reads copy that rims a floor plan of the house where the act took place, which, spanning two black pages, is smeared with white brush blots to track the blood that Carroll says was shed all over the home. There’s a documentarian quality at play as well, with present-day “interviews” — the visually selective kind, revealing little more than eyes or lips — conducted with shell-shocked individuals who’d participated in the game inspired by Herron’s death. 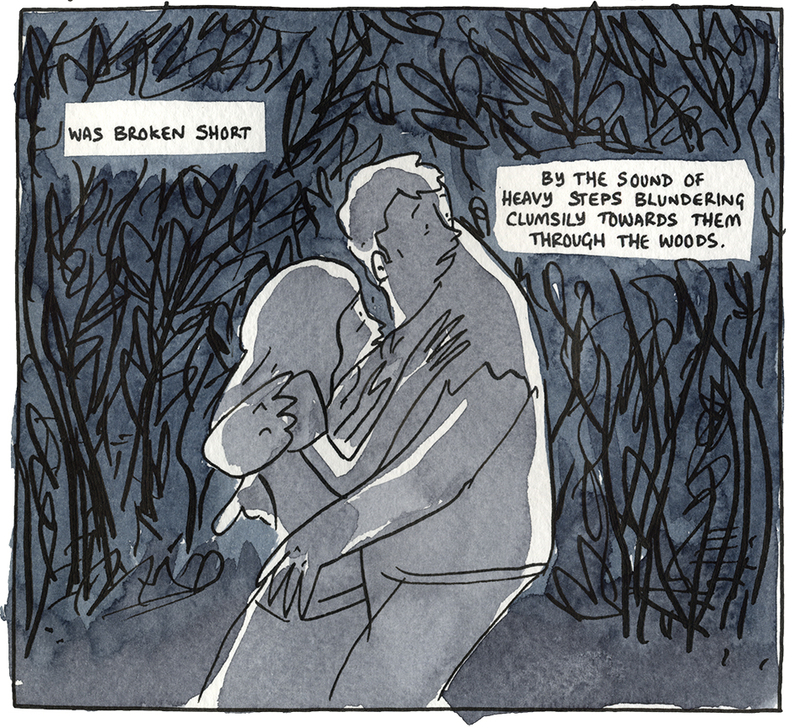 The shifts to current conversations, set in washed-out colors as opposed to the black and white pages that tell Ann’s story, are abrupt, particularly given the minimal amount of text in whole. Carroll’s art does a lot of the work — the page layouts are playful, with a conventional nine-panel grid sometimes sandwiched between sequences that are more freeform, where the creator’s slender type is fitted inside of a grave marker or less frequently, in one of the comic’s bulbous, long-stemmed word balloons. For the background details, torn and black-bloodied photographs spotlight the Herron family history, itself built upon a string of morbid tragedies. Spiny tree branches and tall hillsides loom in Carroll’s powdery, charcoal-grey backdrops for this grim work, while horizontal panels also offer only part of the faces at the story’s center — cat eye-slits and an occasional grin. I can only assume that our “Ann by the Bed” author was wearing the same expression when she put this sinister work together. Back in October, UK comics creator and podcaster Dan Berry posted to his website the result of working on a comic for 24 hours — Berry is the producer and curator of the Twenty Four Hour Comics Marathon at the Lakes International Comic Art Festival in Kendal, England, wherein seven comics artists file into a room and draw comics for 24 hours, nonstop. This year, Berry’s work yielded the “tale of doomed love” that he calls Nicholas & Edith. 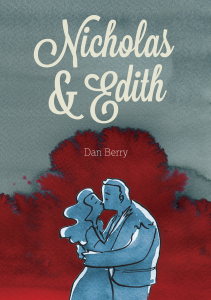 Still freely accessible online — and in print, in a limited capacity — Berry’s Nicholas & Edith is a rich watercolored work set largely along a coastline in a small fishing village, where a fisherman’s daughter and a boat builder’s son fall in love despite an age-old quarrel that has divided their families. Because of the rivalry, Nicholas and Edith are forced to relegate their relationship to secret locales. 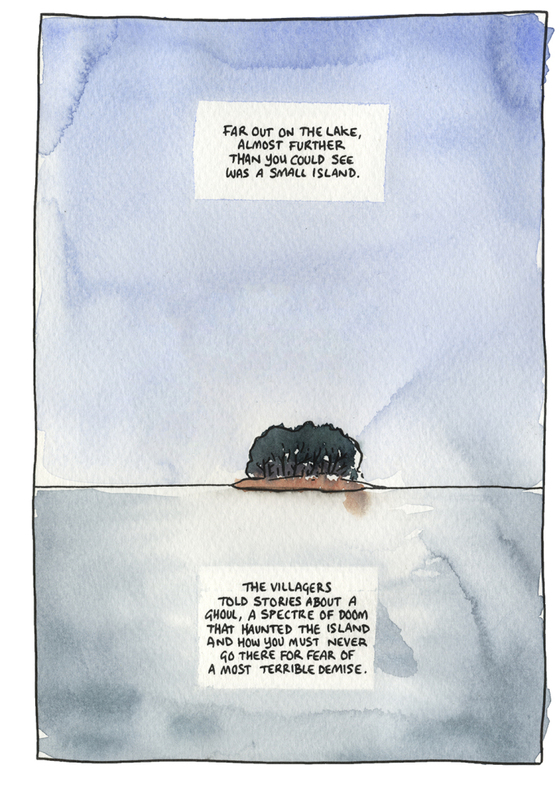 They venture out to a small island that villagers say is haunted by a ghost. There’s all sorts of colorful language like that in Berry’s short but stirring Nicholas & Edith — the copy rings of dusty old horror prose or the kind of ghost stories that Emily Carroll seems to admire. The energy is matched in Berry’s visuals, where tension and terror are conveyed in really dark panels that obscure facial features, and where specific wooded landscape details are blotted out in a barrage of wild black dashes. Bright red pooling blood startles within the otherwise ashy color palette that dominates the comic, and it’s even stronger collectively as a striking symbol of loss, “overpowering” as Berry apparently intended it to. The idea that this came together in 24 hours is mind-boggling. I caught wind of this as soon as it went online, and I feel like I’ve been thinking about it for months. Frontier images © 2014 Emily Carroll. Nicholas & Edith images © 2014 Dan Berry.